My mother was very busy. While I was young, she had to drive 4-5 hours round-trip to work at the hospital daily and work ridiculous shifts. She was not home much, but when she was, the house was ripe with the fragrance of cooked spices. Growing up I had a love/hate relationship with both food and my culture – due in part to being a girl, where and how I grew up and feeling like I was neither American nor Indian nor a good blend of both. Nearly four decades into my life, I still wrestle with a lot of the same issues. But having a little girl of my own has offered me a new perspective as I reflect on my childhood, my culture, my gender, my mother and food. 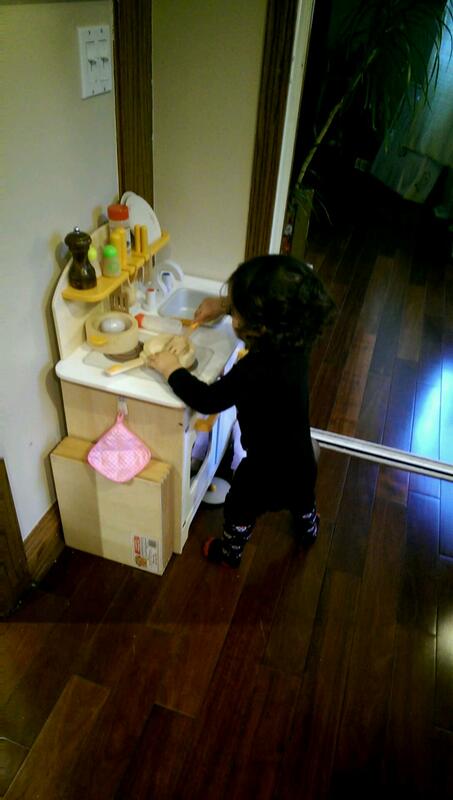 My love of cooking comes from my mother and I am so thankful that I have been able to pass this trait onto my little one. I want to share the comfort that spice and Indian food provides me with my little one. This Whole30-like challenge limits my ability to eat many of the dishes I would normally gormandize because they include paneer (an Indian cheese), yogurt, legumes, wheat and rice. 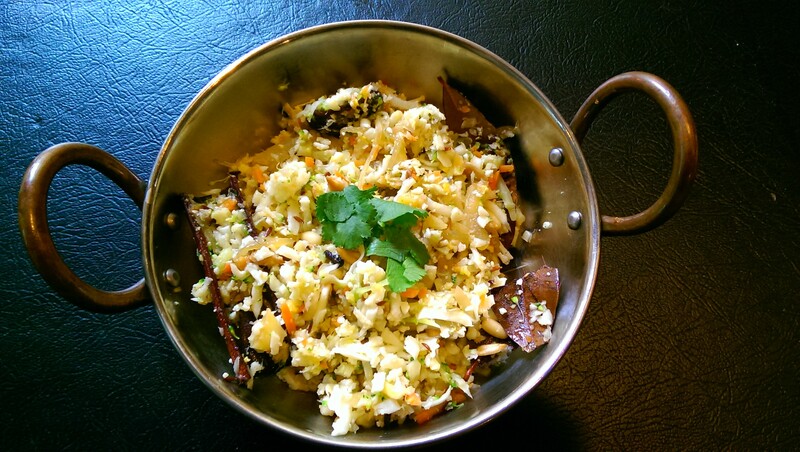 There are many Whole30/paleo friendly meat based Indian dishes to choose from but without legumes and dairy, there are limited protein options in vegetarian Indian cuisine. So I had to reinvent some of my favorite dishes. I made dairy-free saag paneer made with cashew cheese paneer or with whole cashews and cauliflower pulao with sunflower seeds and pine nuts. Saag is dish of leafy greens that are cooked down with spices and blended, often with heavy cream. 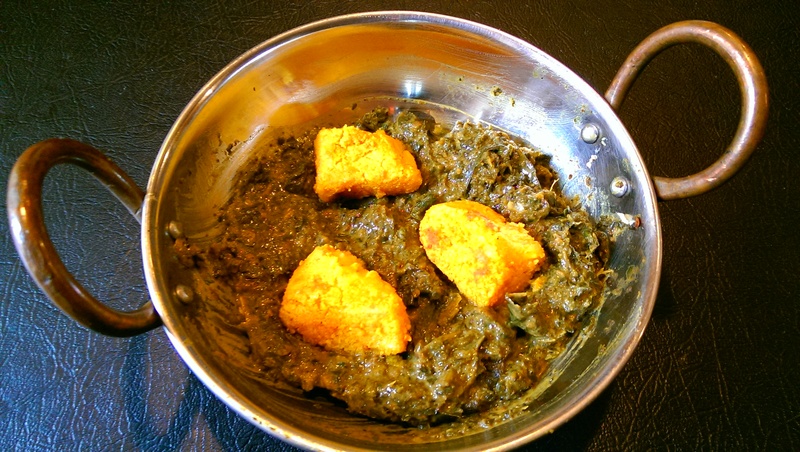 While it is not unusual to make saag without paneer, the cheese gives it nice texture and flavor. It also adds protein. You may have heard of palak paneer (this uses only spinach) or sarson ke saag (mustard greens). With Saag you can add almost any green, including cilantro and mint, but note that some greens taste more bitter than others. I use a variety of leafy greens including a mix of spinach (least bitter), collard, kale, mustard and turnip greens (more bitter) to add more variety and nutritional benefits. If you don’t have time, use spinach which cooks the fastest as opposed to collards which require a lot of time. I added some Nutiva organic hemp protein powder to add protein (15 grams per serving). On its own, the powder has a slightly sweet but nutty sawdusty taste, so it is best to hide it in a strong favored dish, especially one with greens (as it is green in color). Be careful to not cook it as you will lose some nutritional benefits with heat and not to add too much or the dish will be grainy. Kaju means cashew in Hindi. They are used quite often in Indian cuisine for their neutral taste and starchy fatty qualities. Cashews are actually seeds, not nuts, and have about 5 grams of protein for an ounce, which is roughly a quarter cup of whole nuts. In the easier version of the dish, I simply cooked the saag and added whole raw cashews. To eat it differently than I normally do, I made a crispy egg to top it off. Certainly not traditional, but I think the best cuisine comes from blends of culture and techniques. What a beautiful combination! 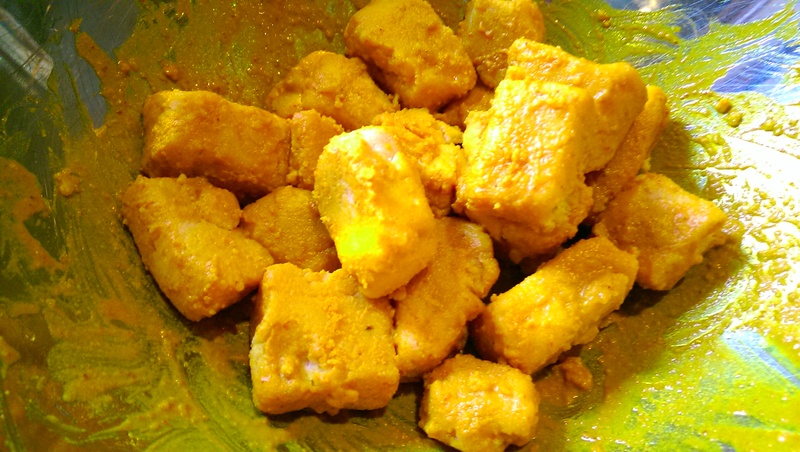 Paneer is an Indian “farmer’s cheese”, firm but spongy, made by separating the milk curds from whey using an acid and straining the curds. 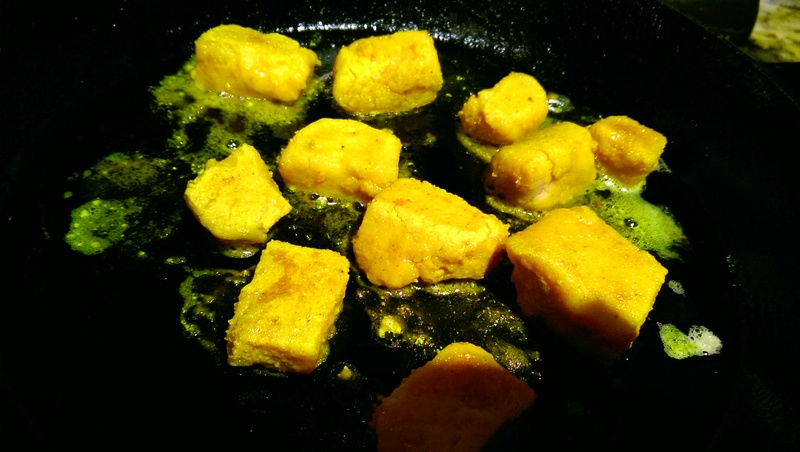 Paneer itself does not offer much flavor aside from a bit of saltiness, nor does it melt. It is used for both savory and sweet Indian dishes. I have used cashews to make faux cheesecakes for dessert, as well as for cheese for savory dairy-free pizza. 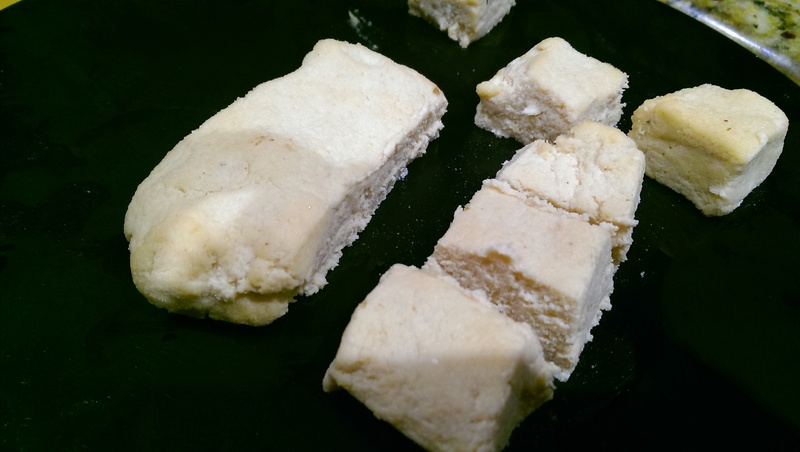 I decided to try and make cashew cheese that mimics paneer. The cashews were soaked for 4 hours in water, blended until smooth and then strained through a cheese cloth to rid it of any extra moisture (my food processor requires a lot more water to blend than my vitamix). Make sure the cheese cloth is not the thin holey variety found in most grocery stores – it should be washable reusable muslin that will actually strain liquid. 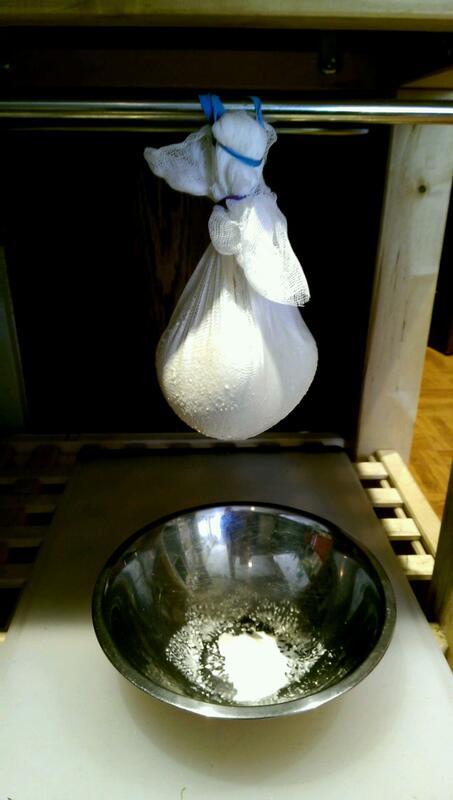 I used rubber bands and the pan/towel hanging rack on the kitchen island to hang the cheese. Other ways to hang the cheese include tying the cheese cloth onto a wooden spoon and placing the spoon on top of a mason jar, or placing the cheese cloth ball in a colander that sits on top of a bowl. If the cashew cream is just a thick paste, you can skip this step. Once it drained, I added arrowroot starch and coconut flour and kneaded it like a dough (it will be very sticky). After pressing it flat and firming it for at least an hour in the fridge it could be cut into cubes. 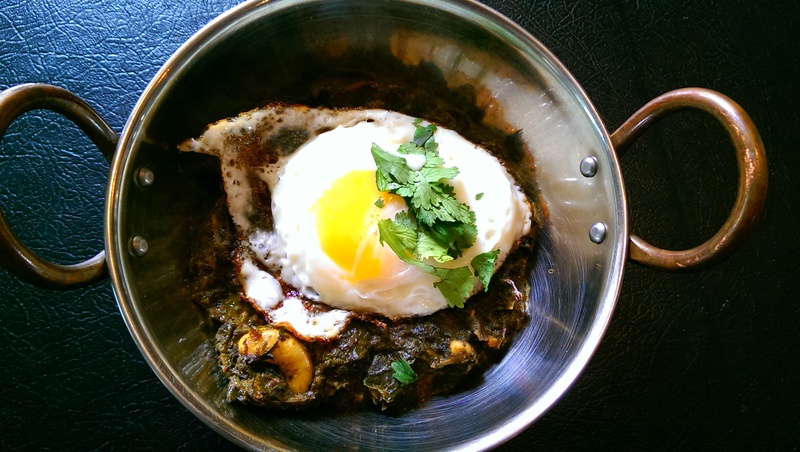 The best saag paneer I ever tasted used a spiced pan fried paneer. So I marinated the cubes in spice and oil and pan fried them. It reminded me of paneer. To be honest, I will always prefer dairy cheese over vegan cheese, but this is a great substitute for dairy-free diets. Based on how I have been feeling, this challenge has taught me that I do need to reduce dairy as much as possible for my own health, so it is good to have options. I typically eat saag paneer with rice and/or an Indian bread. 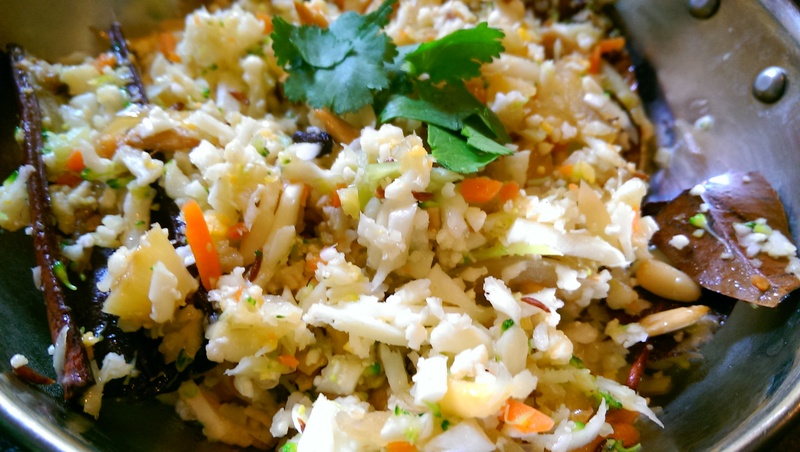 I am working on a paleo indian bread but for now I will eat it with pulao, a spiced “fried” Indian rice, made from graded cauliflower instead of rice. I left out the peas often used and added sunflower seeds and pine nuts for texture and added protein. It was satisfying – and the hug I needed at the end of the day. Stay tuned for more. Melt ghee in a large pot over medium heat, add garam masala, cumin, coriander, turmeric, cinnamon and cayenne and stir until fragrant (about 1 min). Add in onion and cook until soft and golden (about 5 min). Add ginger and garlic, mix well and saute for 1-2 minutes with occasional stirring. Add in greens and 1/2 cup of water, stir, cover and let simmer for 20-45 min, stirring occasionally, adding water as needed, careful to not let the bottom burn. (Cooking times depend on the greens used. Collards require up to 45 min at least). Take off heat. Place hemp powder into a sifter or strainer and sift into the dish (or slowly spoon in to avoid clumps) stirring frequently to incorporate. Add in coconut milk a little at a time, while blending (in a processor or with an immersion blender) so the leaves are broken up but not completely blended to a liquid. Add salt to taste (note saltiness of paneer if adding that in). Add in raw unsalted cashews or paneer or both. Garnish with cilantro. Blend in a food processor or vitamix with as little water as possible yet as much needed to make a smooth creamy paste. 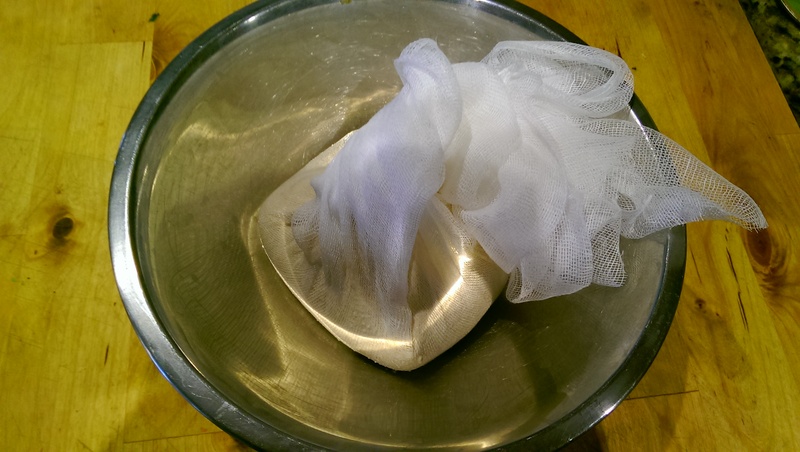 Place cashew cream in a cheese cloth and strain excess water as needed. Place cream into a bowl and add arrowroot powder and coconut flour and knead by hand until it can form a loose (but sticky) ball. Oil a dish and place ball on the dish and flatten it. Place in the fridge for at least an hour. This can be left overnight. Once firm, cut into cubes. Mix together oil, tumeric, salt and cayenne. Coat the cashew cheese and marinate in the fridge for at least 20 min- 1 hour, again can be left overnight. Cook in a pan – cook on all four sides until golden brown. Heat ghee in a pot. Add peppercorn, bay leaf, black and green cardamom and cinnamon and cook until fragrant and cinnamon opens – about 2-4 min. Add cumin and stir and add onion. Cook until soft and golden (about 7-10 min). Add ginger and garlic and sautee for 3 min. Add broccoli and carrot and cook for another 3 min. Add cauliflower, mix thoroughly and cook for 5 min. Add 1 tsp additional ghee, sunflower seeds and pine nuts. Salt to taste. 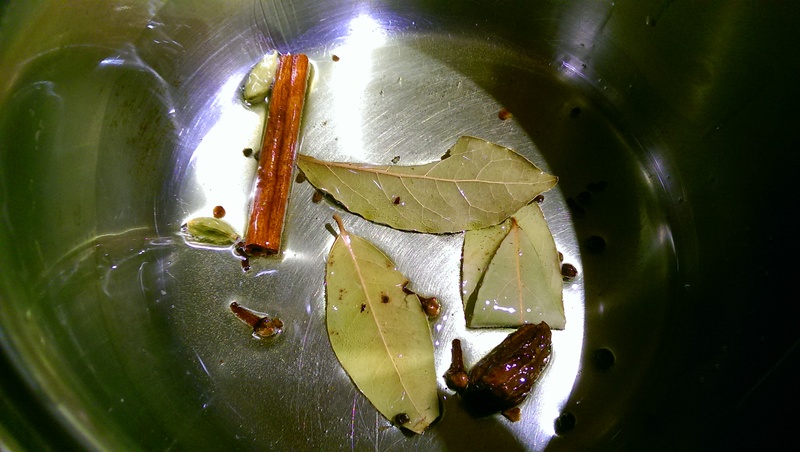 Remove the bay leaves, cinnamon, cloves, and cardamom. Fluff and garnish with cilantro and serve.